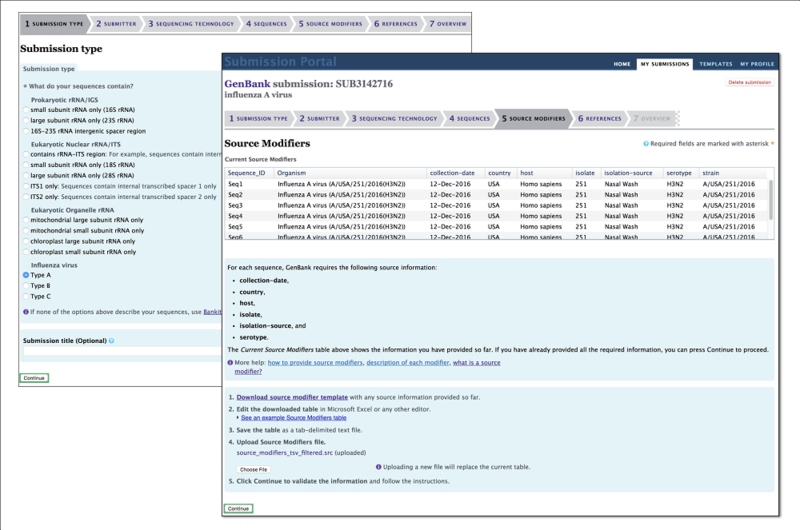 NCBI now offers a flu sequence submission wizard that makes submissions easier and will provide you with accession numbers sooner. To get started, sign in to NCBI, go to the Submission Portal and choose the link for “Ribosomal RNA (rRNA), rRNA-ITS or Influenza sequences” from the GenBank section. Next, select the radio button for the type of influenza virus (A, B or C) that is the source of your sequence, then follow the guided process to fill in the forms. You only need FASTA formatted sequence files and basic information about the source of the samples (collection date, your isolate identifier, the isolation source, serotype). As with the other submission wizards, the specialized flu wizard will streamline the process of submitting data. The flu wizard joins the Ribosomal RNA (rRNA) and rRNA-ITS wizards on the Submission Portal. This entry was posted in What's New and tagged FASTA, GenBank, influenza, submissions by NCBI Staff. Bookmark the permalink.